The 30-yarder from Hawkins lit up a cup tie, in which the home side had the better of the chances, in a closely-fought encounter with the second-placed visitors from East of Scotland Conference A. “I thought we were the better team and were the team that tried to play football; they were very direct and we knew we had to be up to the challenge of meeting them physically – and we done that,” said Shand. “After that I felt like we looked the only team going to win it. “The goal was a moment of brilliance, an unbelievable finish. It was a really good passage of play leading to the goal and we deserved it. Shand has been in the Tranent hotseat for almost seven weeks since taking over from Max Christie, and he is adamant his decision to leave former club Musselburgh Athletic for a new challenge has already been vindicated having taken over a squad with bags of potential. He continued: “I’m loving it so far. It is early days and there is a lot of work to do, but I’ve inherited a good squad of players and we just need to try and a add a little bit of quality to it to support them. “The plan is to keep the squad together – we’ve got boys like Bradley Barrett, 18, and Ciaran McKenzie who is a young boy who came in and stood up. That’s the sort of talent we’ve got in the changing-room and it’s just trying to get the balance right, but that’s down to us in the background. “I needed a change, and the change came about a lot quicker than I thought it was going to, but I thought it was the right one and I’m convinced it is the right challenge. I’m enjoying it and looking forward to the challenge again. Midfielder Bob Berry had Tranent’s real first chance after 15 minutes when he headed narrowly over from Ian Black’s free-kick, before Josh Morris forced home goalkeeper Sinclair Inglis into his first save three minutes later. Chances were at a premium for both sides, but Tranent ramped it up a level before the break and were unlucky not be in the lead at half-time with Barrett going close. 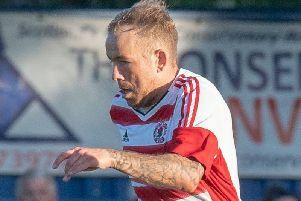 Former Tranent striker Daniel Watt was close to scoring against his former club after he flung out a leg but couldn’t direct his shot on target to trouble Inglis. Neither side could get into a rhythm with referee Craig Wilson having to stop play frequently. Hawkins then found the net with his spectacular strike after cutting in from the left side on 68 minutes. Inglis was given a let-off with ten minutes to go when the usually reliable keeper missed his attempted clearing punch, but luckily for him right-back Grant Nelson was on the line to spare his blushes. Striker Mark McGovern twice went close late on for the hosts as they looked to wrap up the tie, which could have gone to spot-kicks had Watt connected properly with his header in the dying minutes. Tranent: Inglis, Nelson, Hawkins, Whitson, McKenzie, Miller, Fisher, Black (Paterson), McGovern, Berry, Barrett. Hill of Beath: Hall, Leishman, Kellichan, Wright, Conners, Mitchell, Grierson, Morris (Kay), Watt, Elder, Kirby (Nicoll).